It feels like it has been a long time since we have gotten a ton of brand new footage related to one of Marvel’s Netflix projects. Daredevil premiered way back in April of this year, and while we’ve been getting teasers for the new show, Jessica Jones, in recent months, today is the first time Netflix has released an official trailer for the series. Give it a watch, below. The trailer starts with a voiceover introducing us to Jessica Jones and her profession, which involves--according to her--making enough money to buy some booze at the end of the day. She quickly meets Luke Cage in this trailer, proving how integral to the storyline that Mike Colter’s brand new character will be. If you've been keeping tabs on the series, you should already know that Jessica Jones was a superhero in her former life. She quit and now she owns a detective agency, looking into others with special abilities like her own. Regardless, Mr. Cage makes it clear early on that having superpowers puts a target on her back. The whole trailer is dark. Jessica’s busy having philosophical conversations with Luke Cage, but we also see her dealing with her PTSD and flashbacks, causing her moments of rage. She even breaks a window on a public train at one point. Despite the fact that Jessica is clearly drinking too much in the attempt to avoid her demons, the trailer is emotional too, with flashbacks to the past and plenty of quiet reflective moments where the camera rests on our discomfited heroine. Later in the trailer, we also get to briefly meet the big villain, Kilgrave, too. While we don’t get to see his face in the trailer, we have seen David Tennant's new role in official stills from Marvel. Once Kilgrave comes into play, Jessica seems to have more resolve. Which is good. We don’t mind characters with dark pasts, but they need to have a little spark to them. And a non-funny, drunken detective would be dull without some sort of end goal. 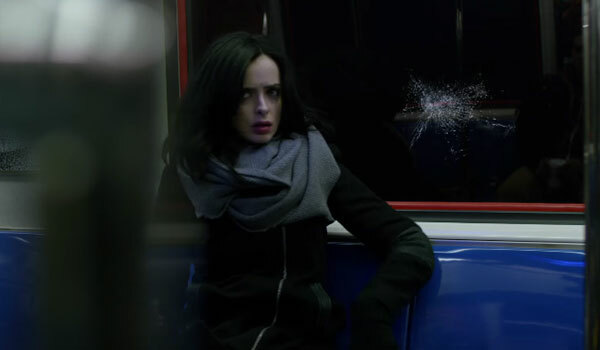 Speaking of sparks, the trailer also confirms that Luke Cage and Jessica Jones will hook up. Unfortunately for Krysten Ritter, the only moment they use is this over-the-top "O" face. Did we mention Jessica Jones, like Daredevil, is going to be a more adult Marvel show? I'm a little surprised it took this long to get the full trailer for Jessica Jones, considering the show hits the schedule next month. However, this trailer was worth the wait. If you're wanting more information on Marvel's latest Netflix series, you can check out what we know about Jessica Jones. In addition, you can bingewatch the series to your heart's content starting on Friday, November 20 at 12:01 p.m. PT.